When I was a kid, I enjoyed being organized. I asked for a filing cabinet for my birthday one year. I re-organized my desk at least once a month. In short, organization was my thing and those organizational skills helped me excel in school. I’m realistic enough to know that I was probably the exception, not the rule. There are many kids who need a little assistance getting organized and learning the necessary skills to help them be more successful in class. An new book by teacher Audrey Klein, Skills for Students’ Success: Organization, Study, and Writing Skills helps students to learn and develop these essential skills. Skills for Students’ Success: Organization, Study, and Writing Skills is written from the standpoint of a teacher giving individual lessons to a student. However, the material can be used in a classroom or home school setting for children in grades 4-9. This book also works well for basic adult education and English as a second language for adults. Online classes are offered with this book at this Web site. Both the Web site and this handbook offer lessons, writing samples, and activities for students to improve reading, writing, organization, and study skills. If first impression is everything then Audrey Klein, the creator of Klein’s Classes, gets an A plus from me. A very beautiful leather black zippered organizer greeted me when I opened the box from Klein’s Classes. At first I was trying to figure out if I had ordered a planner, but then I unzipped it and saw a book in the side pocket and realized it was the Skills for Students’ Success kit. I couldn’t wait to dig in to the planner to see what was in it. 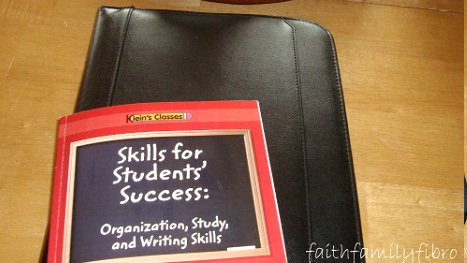 First a book titled Skills for Students’ Success: Organization, Study, and Writing Skills was included. This is the meat of the program. Written by Audrey Klein, Skills for Students’ Success: Organization, Study, and Writing Skills provides everyone that reads it with essential tools to classroom success. The book can be used for the classroom, home school education, adult basic education, and English as a second language. Honestly, I hated any type of writing in school. That would include everything from creative writing to research papers. I hated college composition and speech which were required courses. If I would have had this book back then I think it may have changed my mind about how I felt about these classes and made it easier for me to enjoy them. I know it would have taught me a lot more than my teachers did. I really loved reading this book and I found myself highlighting items that I can use now in my blog writing. I learned about all the different types of writing from personal narratives to business letter writing. I learned how to takes notes and keep organized in classes. I also learned more about reading and libraries. Skills for Students’ Success: Organization, Study, and Writing Skills is full of information that you should have. I also found that this book is a great tool to have for my 9 year old daughter. It will help her with study skills and writing. The information was easy to read and understand. Audrey Klein rates this material for grades 4 to 9. In truth, Skills for Students’ Success: Organization, Study, and Writing Skills can help both of us in reading, writing, time management, organization, note-taking, attitude and test preparation. This book will be used throughout my children’s’ education and also for my future endeavors. Selling for $23.95, Skills for Students’ Success: Organization, Study, and Writing Skills is a worthy investment in a book that can be used for many years. 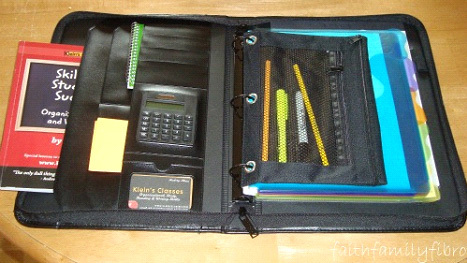 The Student Success Supplies Kit, which sells for $58.95, is a 3-ring binder with a zippered closure which contains all the accessories you need to stay organized, including notebook paper, plastic dividers, typed and blank divider labels, and a pencil holder with highlighter, pens and pencils. It also has index cards, a mini notebook, a pad of lined paper and a solar calculator. I couldn’t think of anything that was missing. Although I did love the convenience of an organizer planner that was all put together for me, you might be able to assemble your own kit for less money. If you visit the Klein’s Classes website you will see that in addition to the book, there are the online classes that go over each chapter. These sell for either $75, which includes all chapters, or $14.95, for one chapter at a time. The video classes match the chapters in the book and can be used interchangeably depending on your child’s or your own learning style. I find that the video along with the book was extremely helpful. I learn better from seeing, reading, and writing. The book, classes, planner all sell separately so you can make your own package that fits your needs and matches how you learn the best. I learned a lot from Skills for Students’ Success: Organization, Study, and Writing Skills and from the online classes. My recommendation would be to buy the book and the online class package. For those of you who need a little more help organizing, the planner might be a worth-while investment to help get you started. No matter what your age, with Skills for Students’ Success: Organization, Study, and Writing Skills you can learn something new or brush up on your skills that you learned a long time ago, like me. Kudos to Audrey Klein for teaching this old dog new and helpful information! I am so blessed that you let me review your products. Thank you! One winner will receive a copy of Skills for Students’ Success: Organization, Study, and Writing Skills, the Student Success Kit, and access to the online lessons. 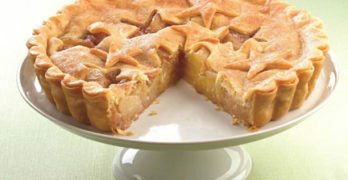 Visit www.kleinsclasses.com and leave a comment with what you like the most about this tool. For ONE bonus entry, subscribe to The WiC Project via reader or via email and/or “Like” The WiC Project on Facebook. Leave a comment letting me know that you have. For ONE more bonus entry, visit WiC Chick Karen at Faith, Family & Fibro and follow her on Twitter, Facebook or subscribe to her blog. Leave a comment here letting me know that you have. Giveaway ends at 11:59 PM EST, Aprils 27, 2011. Disclaimer: This post consists of my (and/or fellow tester) opinions only. Your experiences may be different. No compensation was given for this review/giveaway. WiC Chick Karen did receive a free product from the manufacturer or their representing PR agency to use and test for the purposes of this review. This did not affect the outcome of this review. I like that all the accessories fit neatly into the binder! What I liked most was the chapter on Organizational and Study Skills. This is very much needed. As a parent, I highly recommend zipper binders for middle school students. If you have a 5below store (mid-atlantic), you can get them in august for $5. A wonderful supplement to what my child is learning at school. And the organizer is extremly durable and could be used for years. What a great tool! This package has everything a child needs to stay organized and it’s great value for money. The sturdy 3-ring binder with closures and multiple accessories which come with the Student Success Supplies Kit are worthwhile and complement lessons from the book. While my son has certainly become better organized, I think this attractive binder system keeps him organized as a tangible daily reminder of the skills he’s learning. I like the information about organization and study skills. My ds16 could really use that. This is an invaluable resource to help get your child organized. The writing skills portion especially has been of great help to my daughter, who sometimes has a hard time organizing her thoughts for school essays. Audrey is amazing! I learned- Organization, Study, and Writing Skills is written from the perspective of a teacher giving individual lessons to a student. I like the Writing a Comic chapter. I like that it helps you with answering essay questions and speeches. I like chapter 2 about time management and organization. I believe them are key factors for children to learn young. I love everything about it. Organization is important to keep kids on task! I think we’d both like the Writing a Comic section. We’ve tried and failed; maybe this will help!